It wasn’t until we showed up at Sean’s mom’s house in Littleton, Colorado that we realized just how bad we smelled. The first thing I noticed as we biked into the subdivision Sean grew up in was how good the entire place smelled. I could tell that a lot of people in Heritage Village use scented fabric softener and dryer sheets. It smelled like half the dryers in the subdivision were running when we arrived. The neighborhood had a sweet smell–like a thick, warm, clean towel fresh out of the dryer. It smelled like Spring Dew, or Alpine Meadows, or Fresh Rain. Dryer sheet names all seem to nod to the pleasant smells of nature, but of course dryer sheets smell nothing like real nature. Real alpine meadows really do smell wonderful, but the smell would be hard for even the best chemists to ever recreate. And that’s because when you’re way up high on a mountain, part of what is novel is that you’ve left most man-made smells behind–like car exhaust and dryer vents. It’s hard for me to describe what an alpine meadow actually smells like, but the words fresh and clean definitely come to mind. Which is probably why the dryer sheet manufacturers claim that their products smell like alpine meadows. Now, the real truth is that living in nature for several months doesn’t feel fresh and clean most of the time. After leaving Seattle in early May, we slept outside probably 50 or 60 nights. We were outside constantly. We slathered sunscreen on multiple times a day and put DEET on at night to preserve our sanity from persistent and abundant mosquitoes. We would go four or five days without showering. One night, near Seeley Lake, Montana, I got almost no sleep because I was sure there was a bear outside our tent. 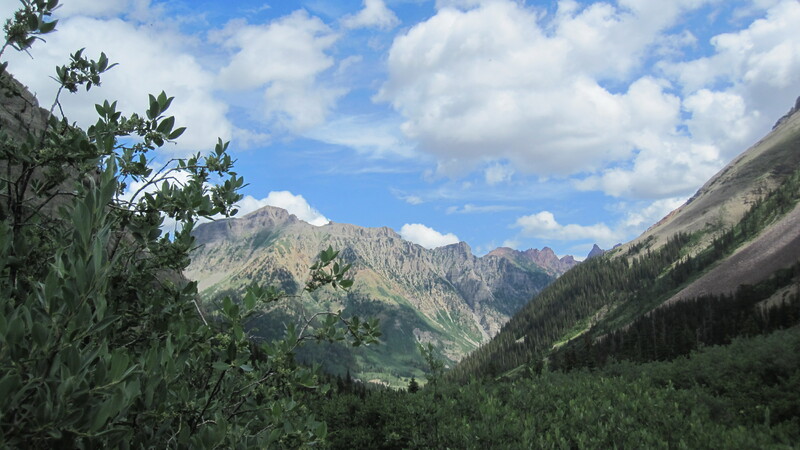 We were near the Bob Marshall Wilderness, an area considered one of the most wild places in the lower 48 and earlier that day we almost ran into a black bear cub on the road. The cub was terrified of us–and I was terrified of it’s mother (which we fortunately never saw). The experience reminded us to be vigilant about bears. Later that same day, we stopped at a convenience store along a desolate, but incredibly scenic road, to ask about where the closest campsite was with a bear box that we could store our food in. It was true. There was almost no human development, just a road, trees, mountains, rivers, and wildlife. 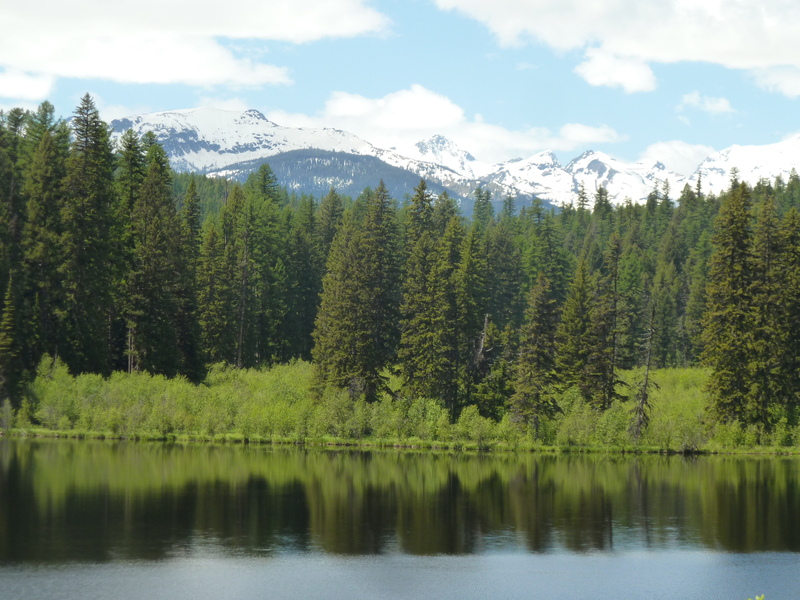 We then clarified our question and explained that we would feel better at a campsite with a bear box, since we heard that the Seeley Lake area is teeming with bears. He didn’t say anything back for a few agonizing seconds. “You people own a pistol?” he said with serious concern in his voice. He didn’t need to ask. He knew we didn’t own a pistol, much less have one with us on our bicycles. He could tell that he had the power. We had no cell phone signal, a bad map, some visible concerns about the local large fauna, and no pistol. He wanted to help us, I could tell that, but he wanted us to feel foolish and unprepared first. Eventually, he took a deep breath and drew an imaginary map on the palm of his hand to a camping spot a few miles down the road where he thought we would find a bear box and “a shitter too.” “You’ll know you’ve found it when you see the shitter.” He kept repeating the directions, sure that we would get lost. He didn’t seem to appreciate our words of thanks as we prepared to ride off. He just sauntered into the store shaking his head and then looked back at us. “You folks should get a pistol,” were his parting words, full of insinuation that if we were mauled by a Grizzly bear in our sleep that night it would be our own damn fault. There is currently a heated debate throughout communities located near Yellowstone National Park in Montana, Idaho, and Wyoming about whether Grizzly bears should be removed from their listing under the Endangered Species Act (ESA). A delisting would legalize the limited hunting of Grizzly bears; currently it is a federal crime to kill an endangered species, unless you are defending a human life. A big source of controversy is related to both how we define what a healthy population is–as well as the methods used to count the bears. While in Wyoming, I read about a recent study published by a University of Colorado Environmental Studies professor arguing that the Grizzly bear comeback is overstated. The population isn’t rising dramatically, rather humans are spending more time counting the bears. “It’s a pretty standard thing in all of wildlife biology and conservation biology that if you triple the amount of time you’re looking for some rare species, it’s likely you’re going to see more of them, just because you spend a lot more time doing so,” explained professor Daniel Doak. While we were in Yellowstone, a family at the campground we stayed at left food out while they were gone sightseeing for the day. A black bear cub came into their campsite and started eating the accessible food. Obviously, other campers were alarmed when they saw the bear. The Park Ranger was called and eventually they shot and killed the cub. They put the bear on a stretcher and walked right by our tent with him. There are a lot of reasons people don’t like spending time outdoors, and the fear of encountering a bear or other large animals probably adds to that. In the parts of the US we cycled through, we needed to be especially vigilant. 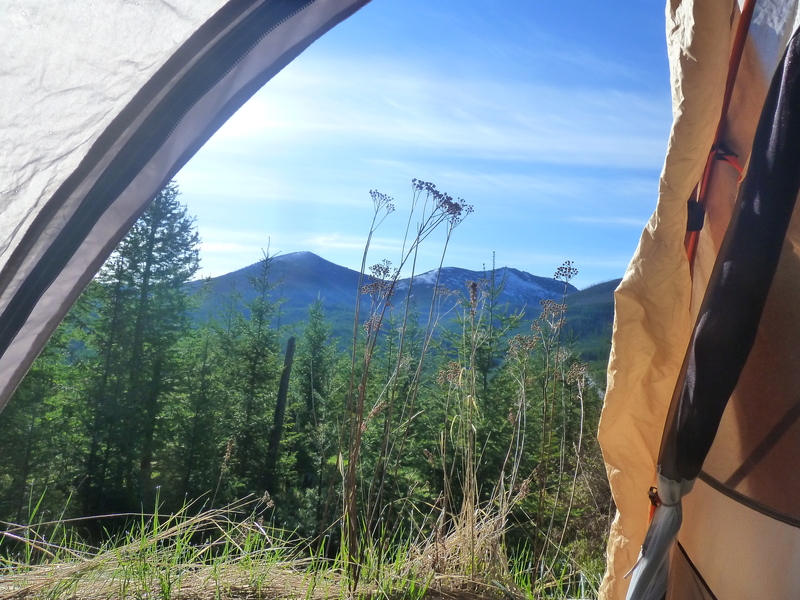 But, living out of a tent in wild places can be a really rewarding experience–whether you are biking, hiking, or kayaking–and for me it is worth it. The simplicity is freeing. No one tries to sell you anything. The impulse to want for things you don’t really need is quieted or goes away entirely. Occasionally, you get bright pink lighting storms as after dinner entertainment. The lifestyle is implicitly healthy. Conversations and relationships take on a new, deeper dimension after prolonged stints in the outdoors. If you are lucky, you might see wildlife (like a Grizzly) from a safe distance. And, after you get home a hot shower and clean clothes (especially if they smell faintly of imitation Alpine Meadows) feels luxurious. 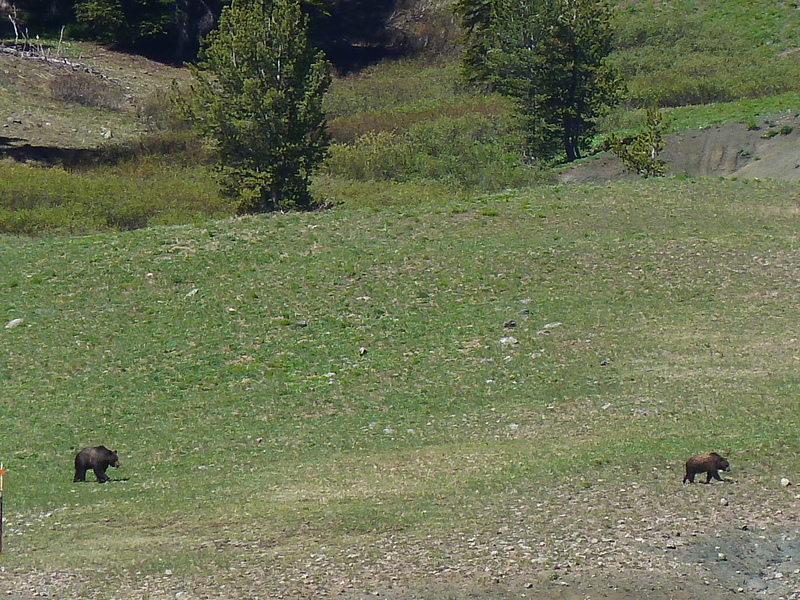 We saw two Grizzly bears, a sow and cub, on the side of a road in Wyoming (almost three football fields away). It was amazing to watch them–and a good reward for getting to the top of a 10,000 ft pass. While we bike, I think a lot about what it must be like to live in the houses and towns that we glide past. 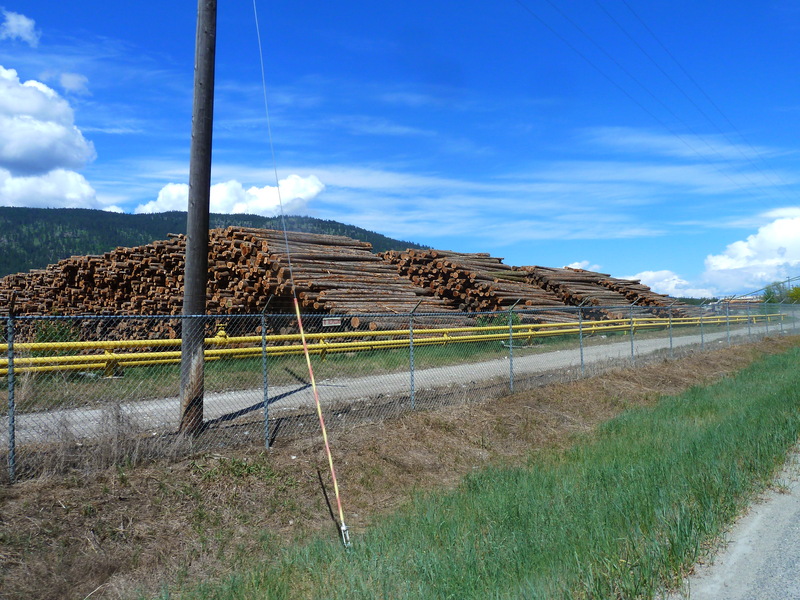 Many of the timber and mining towns look like skeletons of the towns they once were. Analysts at large grocery store chains decided long ago that these shrinking towns would never turn a profit. Instead, a stalwart local usually runs a small convenience store filled with items from Costco or Walmart for resale: packaged processed foods, toilet paper, motor oil, soda and light beers. The fruits and vegetables, if there are any, are shriveling or too soft to the touch; thick layers of dust sit on top of the cans of soup. 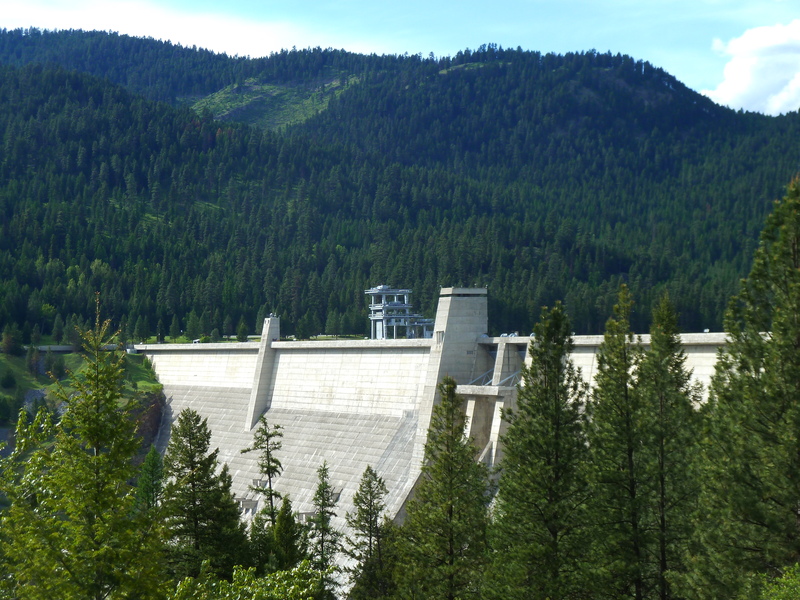 Decades ago, many towns throughout Idaho and Montana attracted workers to build dams and railroads, harvest and process timber, and extract minerals. But, the dams and railroads are built, the timber industry requires far less labor than it previously did, and there are far fewer minerals left to extract than there were several decades ago. The booms are long over in many towns; the weight of the bust seems to settle in more with each passing year. Paint slowly chipping off hollow, abandoned buildings dot lonely main streets. An eery lack of people. Several homes for sale on every block. Yards full of broken down cars. The other headline covered the continued efforts to remediate asbestos poisoning in Libby and the surrounding areas. This is likely a tiresome headline in a town used as the textbook example of the negative externalities of mining. (1) I often wonder what keeps people in these towns: age, family, stubbornness, or poverty. My instinct is to bolt. But, the inability to bolt is often what I like about cycling. We’re constrained to traveling a maximum of 60 or 70 miles in a day, and often we end up in unexpected, unbeautiful, or uncomfortable places. The constraints force you to see or create beauty and make yourself comfortable–at least for a night. We often are in awe of the number of places we never would go to, much less call our home for the night, if it weren’t for our slow pace. 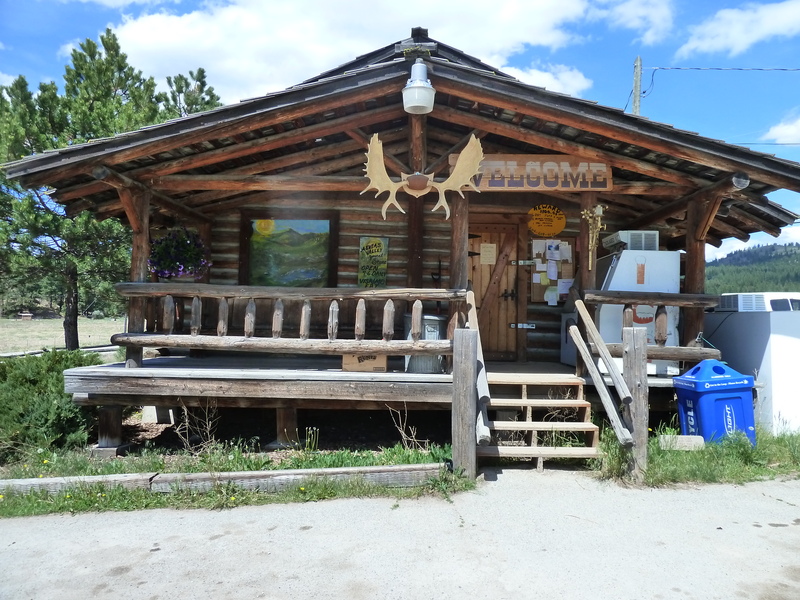 The city campground in Libby, wedged between a grocery store and a cemetery and across the street from a roadside casino with a blinking display board advertising slots and table games, is one of those places. The campground had little appeal and we briefly discussed staying at one of the cheap motels in town, but decided we prefered our sleeping bags and tent over scratchy sheets and yellowing curtains. And, instead of watching HBO in a hotel room smelling of chemical cleaning products, we ended up walking through the cemetery. Much like HBO, cemeteries have stories to tell of love, loss, and the unexpected. The dates of birth and death, the wording on the graves, the signs of recent visitors–it all told a story. The heartbreaking loss of a baby or child. The immense, unending void left by a young couple buried next to each other with Mommy and Daddy engraved on the granite stone. An elderly husband and wife that died within weeks of each other, almost as if they took their marriage vows into the next life. Men who did tours in World War I & II, Vietnam, and Korea. An author with the name of his book on his grave (one final plug to read his book?). It isn’t all busted towns. After only a day in Sandpoint, ID we were already looking for property and envisioning our life there. Sandpoint is a small town nestled a few miles below Schweitzer Mountain and between three different mountain ranges, but it has an urban feel with an abundance of quirky locally owned restaurants, bars, and wineries. Plenty of live music, artist studios, nonprofits, and even some well-known for-profits. It is the most bike-friendly, walkable place I’ve been since I returned from Europe. It doesn’t have much cycling infrastructure, but the sheer number and diversity of people walking and biking is amazing. Drivers are incredibly aware of walkers and bikers and they stop for you at crosswalks, immediately. We walked around town one morning and a hoard of energetic boys on bikes zipped past us, followed by a mom, with a latte in one hand, pedaling next to her young daughter. Then came a girl, dressed in pink from head to toe, on a pink bike unapologetically humming in a happy, spaced-out kind of way. It was the commute to school.There are tons of bike baskets and people don’t lock their bikes up. Our hosts, Chris and Kathy, explained that thanks to studded bike tires, bike commuting continues during the snowy winters. A Sandpoint local that we met in a coffee shop, Larry, invited us to his house, told stories of his past bike tours, lent us a bike map, and advised us to “play like you are with Lewis and Clark” as we made our way through Montana. We hit Glacier National Park on a sunny day when the Going-to-the-Sun road was closed to car traffic. The road was full of people on bikes, of every shape and size, busting their way up the narrow, twisting road to the Continental Divide. Everyone was encouraging each other up the pass and the mountains were so beautiful I wanted to cry. I felt like giving the entire United States a hug. An emotion that I believe is called patriotism. (1) W.R. Grace and Company mined for vermiculite, an ore used in all kinds of construction materials (mainly insulation and plasters), for several decades in Libby. They closed their mining operation down in 1990, but in 2000 the federal government started to investigate the environmental impacts of the former mining operation. In 2008, the federal government launched a criminal conspiracy investigation of W.R. Grace and Company, accusing the company of knowingly exposing workers and residents of the entire town to asbestos contamination. The company (and individuals representing the company) were found not guilty, but W.R Grace was ordered to contribute over $250 million to the clean-up effort. Taxpayers picked up the tab for the rest of the roughly $300 million in environmental and public health remediation. About 300 people died of asbestos-related illnesses in the Libby area and asbestos contamination remains a problem today. “If people are well fed they are happy.” That’s a quote from the author of the National Outdoor Leadership School’s (NOLS) Cookery Book. 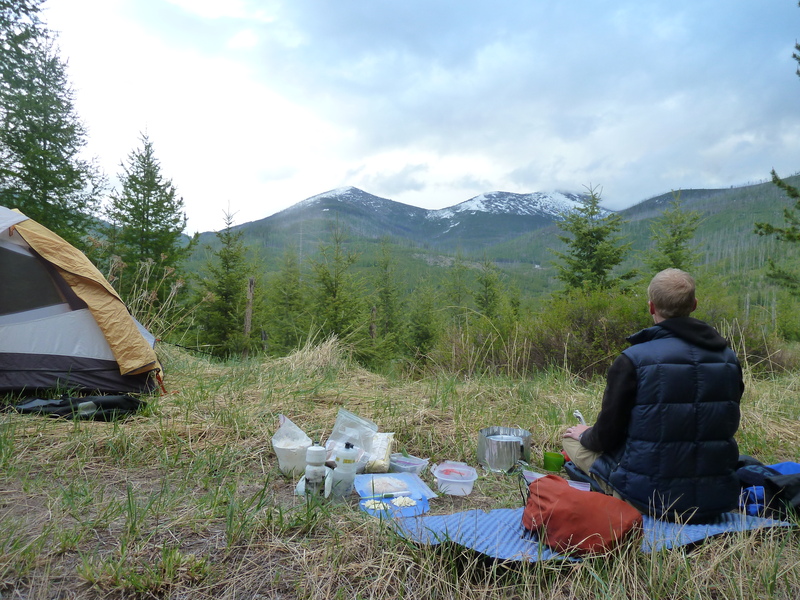 The NOLS philosophy is that people are more likely to enjoy the outdoors if they get plenty to eat–and really enjoy the food they are eating. Biking hundreds of miles each week, dealing with the elements, and sleeping outdoors most nights can be exhausting. Good meals really keep our spirits and energy levels up. 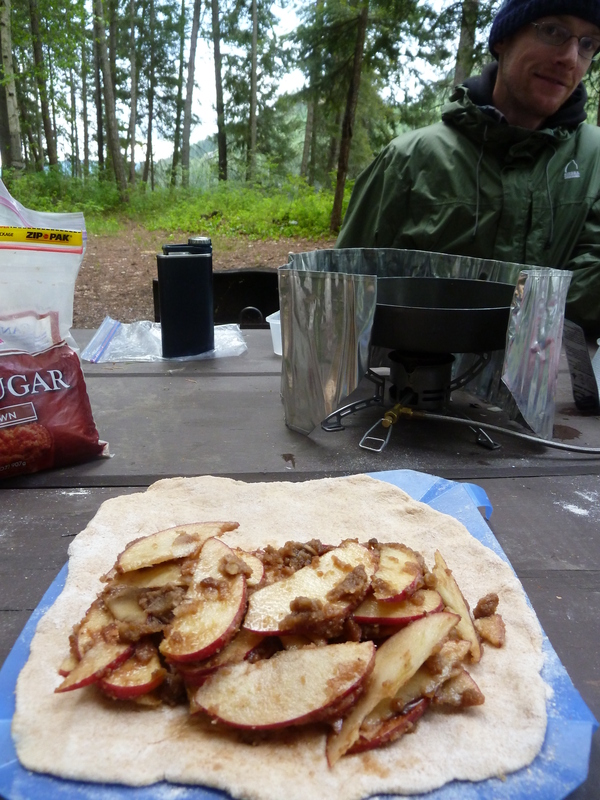 Often, we camp in areas where we can’t go out to eat, so we cook most of our meals on our camp stove. Before we left Seattle, I put together a spice kit with small bags of our favorite spices: cinnamon, Italian seasonings, curry, chipotle powder, a paprika/onion mix, salt, and pepper. We have two small canteens filled with olive oil and balsamic vinegar. We also make sure to have a head of garlic with us at all times. We try to eat vegetables every night at dinner–and olive oil, garlic, and some sea salt can make almost any vegetable taste good. The oil and vinegar inspire us to stop for salad greens and make salads. We snack on dried cranberries and sunflower seeds during the day when we are riding and those can often be great additions to salads too. 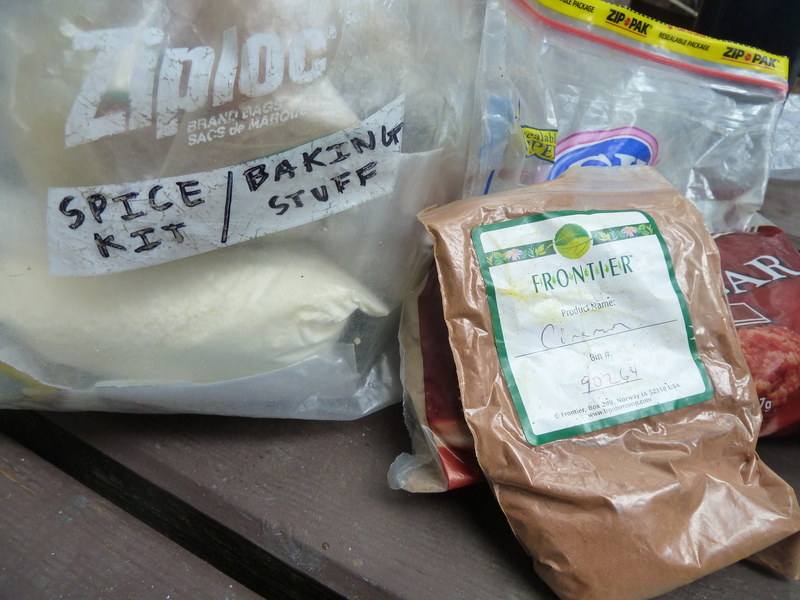 I also packed a small bag with white and brown sugar, condensed milk, and yeast for some of our baking needs. We always have a bag of flour with us. We need a lot of carbs and so we make fresh sourdough bread almost every day. This is not as hard as it sounds–and having warm bread is such a treat. We’re using a process that seemed to be popular about 100 years ago. Last winter Sean and I were listening to My First Summer in the Sierra by John Muir. Muir talks about making sourdough bread in the back country. The benefit to sourdough is that you don’t need to keep adding commercial yeast; sourdough creates it’s own “wild yeast.” Back when we were in Seattle, we made a sourdough starter and a few loaves of sourdough bread in the comfort of our kitchen. 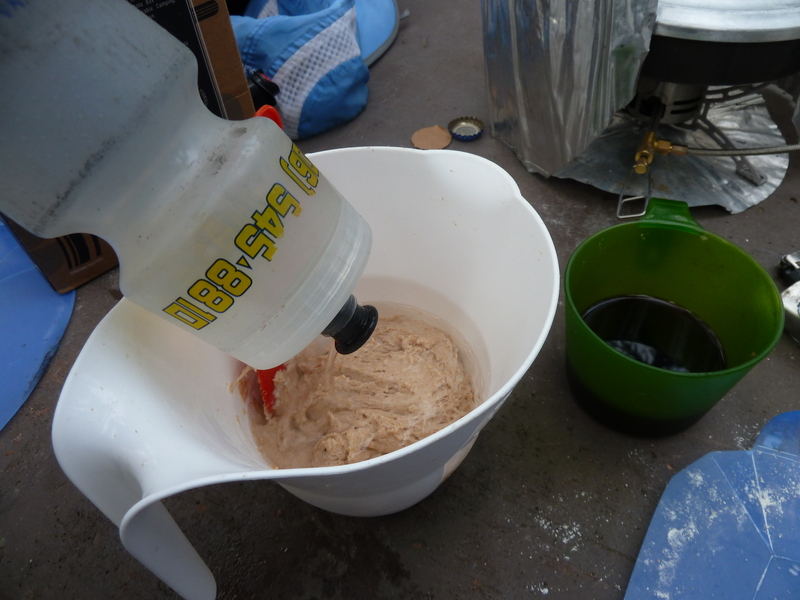 We talked about bringing the sourdough starter with us, but weren’t sure how to carry it or manage it on the road. Sound like an exciting adventure you are about to undertake. 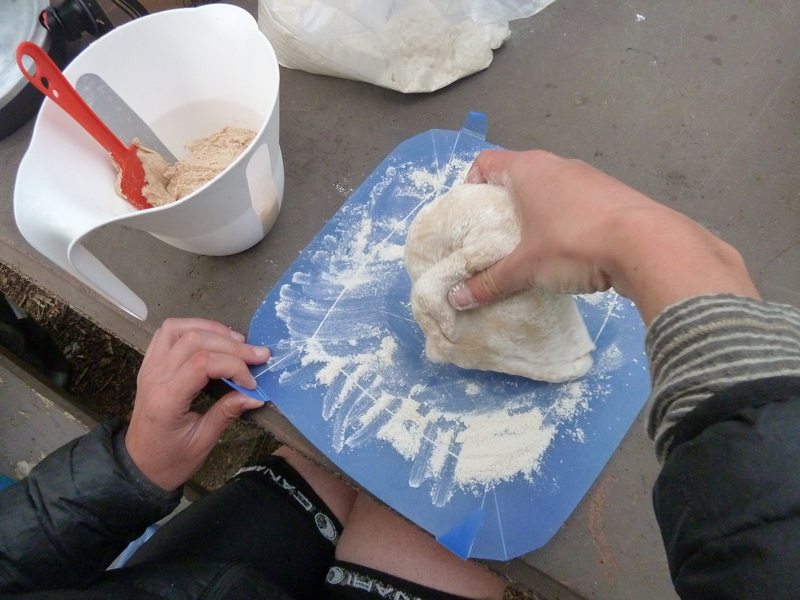 I used to make sourdough bread while in the mountains. You realize that it can take several hours or more for a bread to rise and proof, no? The best way to keep sourdough is just to use it every day or two. If you are on a bicycle, I’d actually put together the bread in the morning and let it rise while you ride. 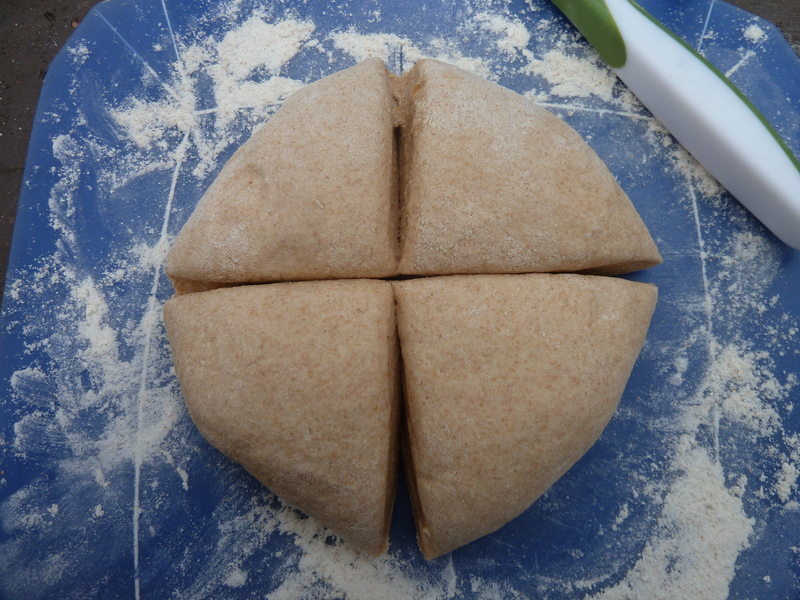 Save about a third of the dough every day to start the next loaf. Hope this isn’t too vague for you. But I assure you, bread is quite forgiving and can be made under many circumstances. Indeed, in a pinch, you can even wind a strand of dough around a stick and cook it near an open fire. Ron’s advice was spot on. The yeast is really happy in a warm pannier. On hot days the dough rises a lot. We store it in a 2 cup measuring cup and put it in a Ziplock. 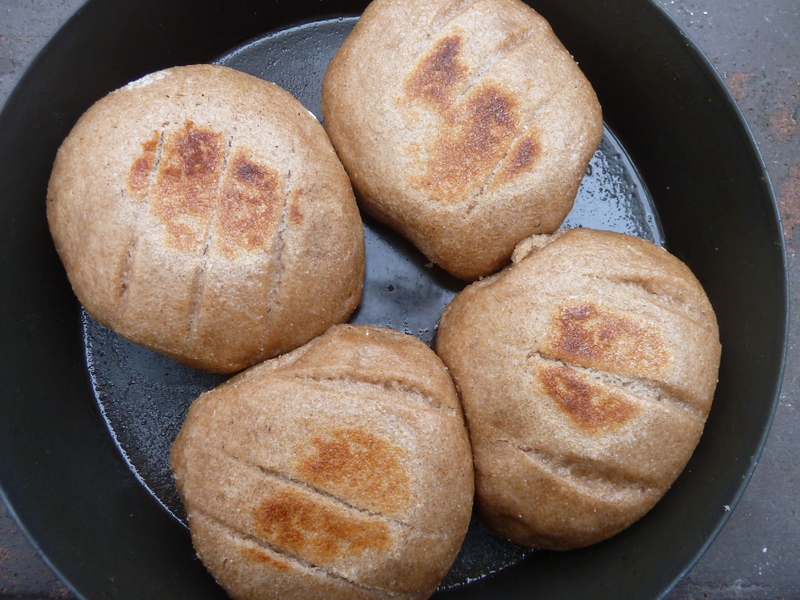 When we are ready to make the bread, we take out about two-thirds of the dough, knead it on a floured surface, make a few rolls, and “fry-bake” it on our camp stove (be sure to coat the pan with some olive oil). 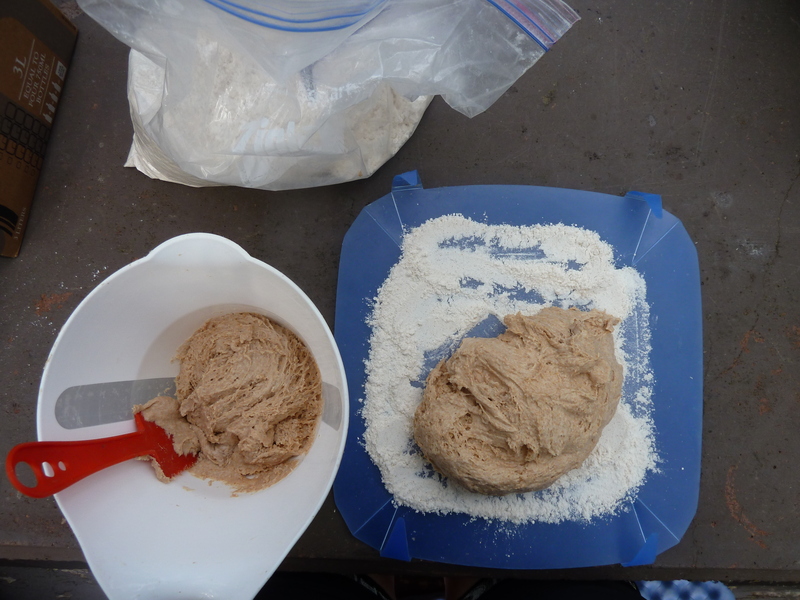 Then we add more water and flour to the original dough in the measuring cup (don’t worry about measuring, just make sure the dough isn’t soupy), put the Ziplock back on, and let it do it’s thing for another 24 to 48 hours. One of our favorite meals on the road is calzone–it’s a really nice treat after a long day of riding. 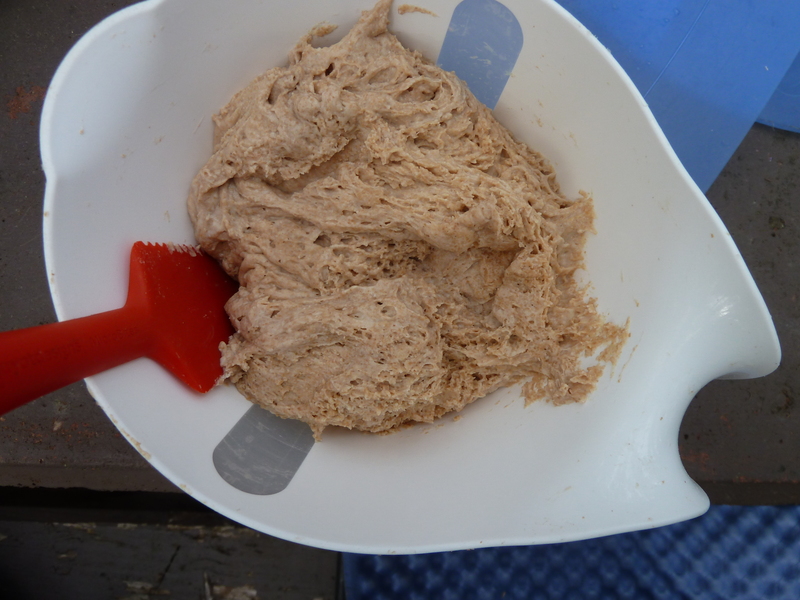 We use commercial yeast to make pizza dough. 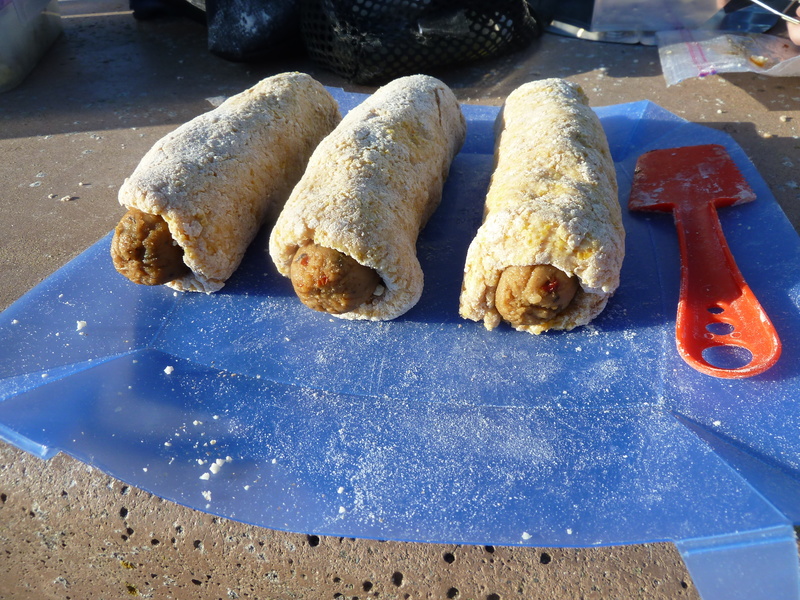 Here is the recipe from NOLS. 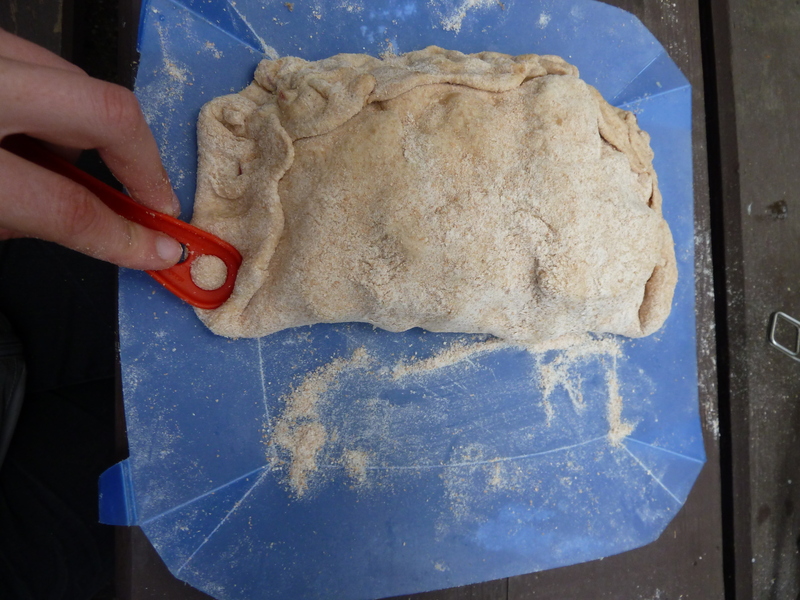 Once you learn how to make the dough you can easily make other treats like apple turnovers using the same dough recipe. We’re having fun cooking–and eating. You can check out a log of all the meals we’ve had here. I hadn’t put much thought into all the other passes. Passes much steeper and longer than Rainy, Washington, or Loup Loup. I’d never seen them. But, they still existed. And we had to get over them. 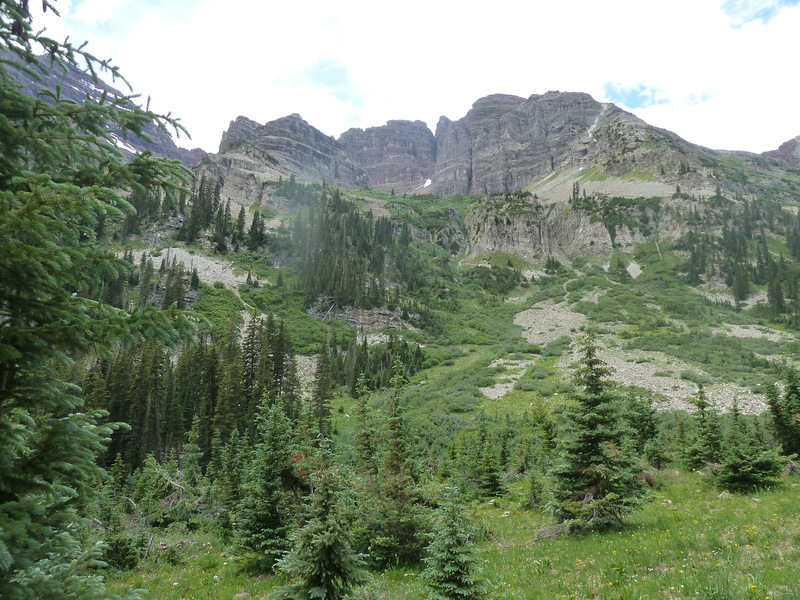 Shortly after Tonasket the map informed me about Sherman Pass–a formidable 5,575 feet pass. We started our climb up Sherman exhausted. The day before we cut off the main bike route to go through the Aeneas Valley and, in order to get back to Highway 20, spent several hours on exceptionally steep gravel roads with frequent cattle guards. I wanted to take the detour because my parents lived in the Aeneas Valley in the early 1970s. They built their own log cabin, grew a lot of their own food, and made what little money they had as small-scale dairy farmers. They named their Holsteins after their favorite (and least favorite) teachers from the Catholic schools they both attended from elementary school to high school. Sister Mary was their favorite cow; her brass and leather cowbell now hangs in their kitchen as a decoration. A little less than a year ago, my mom gave me a large stack of old books related to farming, building log cabins, and self-sufficiency. These were the how-to books they read before and during their time in the Aeneas Valley. The pages of the books were turning brown and yellow and, although it was obvious they hadn’t been opened in decades, I could tell they were heavily used at one point. There were notes in the back of the books with ideas about how to situate the cabin on the property, a drawing of how a gravity-flow water system might work, and a reminder that one acre equals 43,560 square feet. Sean and I started spending our weekends reading these books in our 1,000 square foot mother-in-law. Then, we started checking out as many books as we could from the library related to self-sufficiency. Some of the books we especially liked are: Living the Good Life by Helen and Scott Nearing, Wendell Berry’s The Unsettling of America, The Self-Sufficient Life and How to Live It by John Seymour, and a few books about the tiny house movement. These books provided endless fodder for good discussion during our free time–but the books also brought up some uncomfortable issues. The main issue seemed to be a feeling that we might be missing out on something. Or, separated from something. That there was this other way of doing things that never occurred to us because it wasn’t normal. On a more basic level, we were just really excited about growing our own vegetables. Our discussions about changing our lifestyle became more and more serious. And then, last December, we decided to tell our employers we would be leaving our jobs. It was strange because we didn’t really know exactly what we were going to do yet. Our friends wanted more details. We showed them permaculture books. We’re still not sure exactly what we want. We know we’d like to grow a lot more of our food using permaculture methods and build (or remodel) a home so that it’s as “green” as possible (e.g., passively heated and cooled, solar for electricity, and maybe some kind of on-site greywater treatment). I hesitate to even say “green,” because in my mind we’re a lot more motivated by the idea of exploring smart, affordable home design that will allow us to never pay water, heating, or cooling bills again. The catch is that we don’t want to go live in the backwoods. We’d like to live in or near a community, ideally a walkable/bikeable community. Back in the Aeneas Valley, I was struck by how isolated it felt. After turning off the highway on to Aeneas Valley Road, we essentially had the road to ourselves. A few pick-up trucks went by, we saw a wild turkey cross the road, and eventually we pulled up to a small general store that looked closed. The valley was stunning that day, but it was too quiet for me. And, it was too quiet and isolated for my parents. After several years, they needed new challenges and income streams and moved away. Sean and I didn’t actually bike up to where their old cabin sits. I promised my mom I would go back with her someday to look at it together. But, we stopped at the bottom of their old driveway and took a picture. 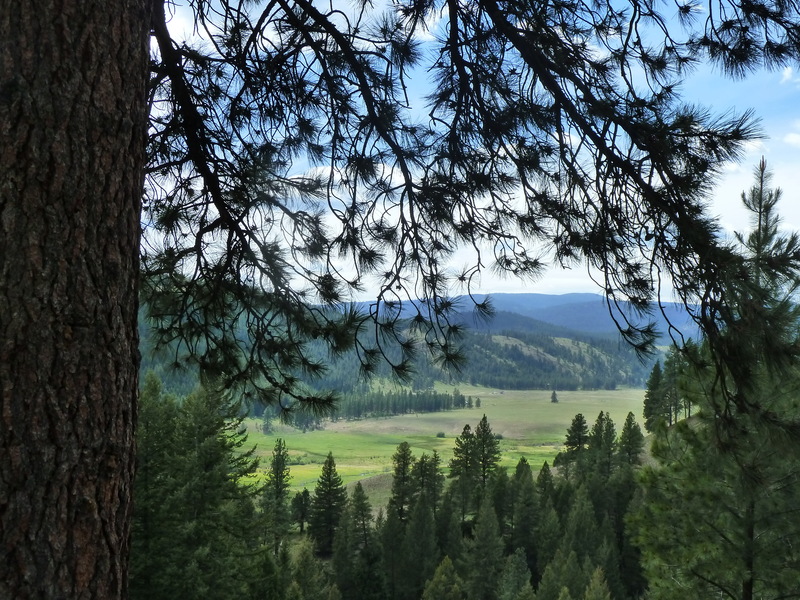 The next day we made it over Sherman Pass and through Kettle Falls and Colville–towns that appear to be the heart and soul of Washington’s logging industry. 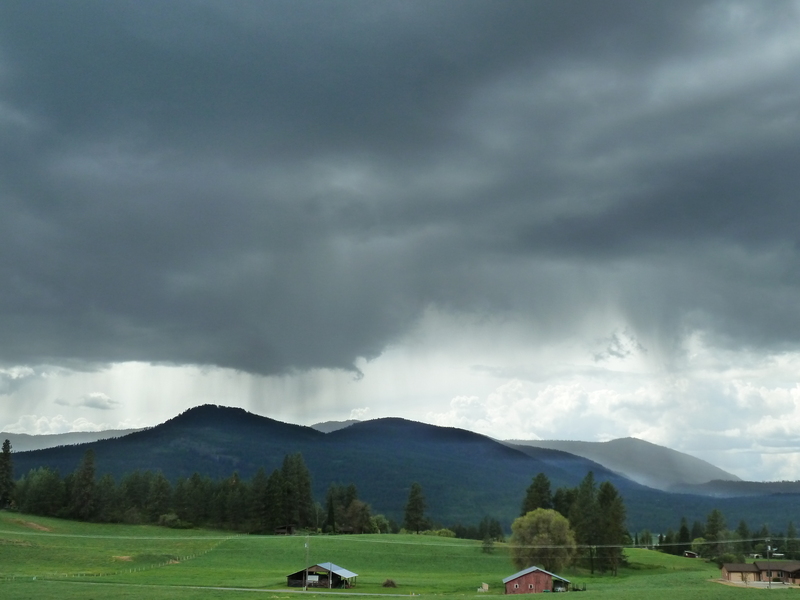 On our way out of Colville, black clouds rolled in bringing thunder and lighting. Out in these rural places, dogs chase bikes. Usually we can bike faster than the dogs and I don’t think the dogs actually want to bite us–but it’s still disconcerting. Outside of Colville, we were about to get chased by a dog when we heard someone bellow: “COPPER! Go home.” Copper, the dog that seconds before was transfixed on either my back tire or my ankle, stopped bolting towards us. The middle-aged man who yelled at Copper was more friendly with us. He inquired about our route, informed us that he was training for the STP (Seattle to Portland), and let us know that we were just 20 minutes from the Colville Bike Hostel. 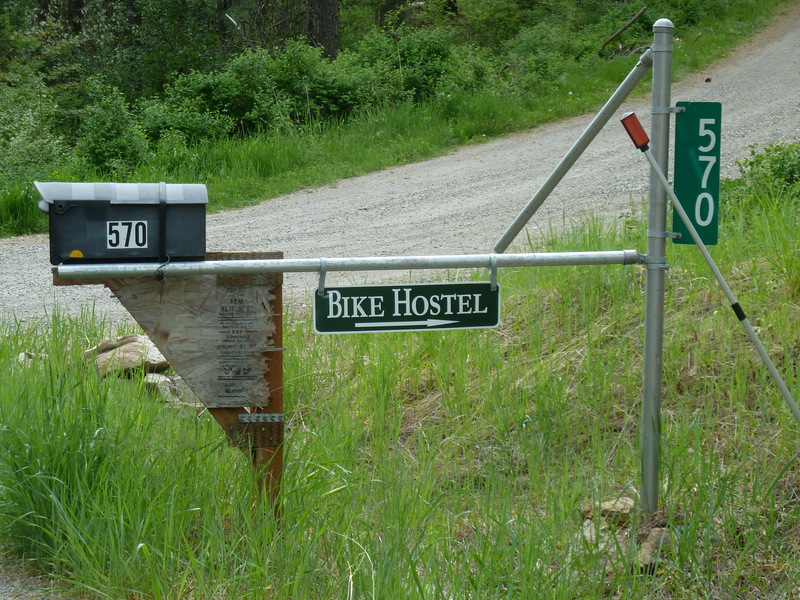 The Colville Bike Hostel is free. Last year, seventy cross-country cyclists stayed there. 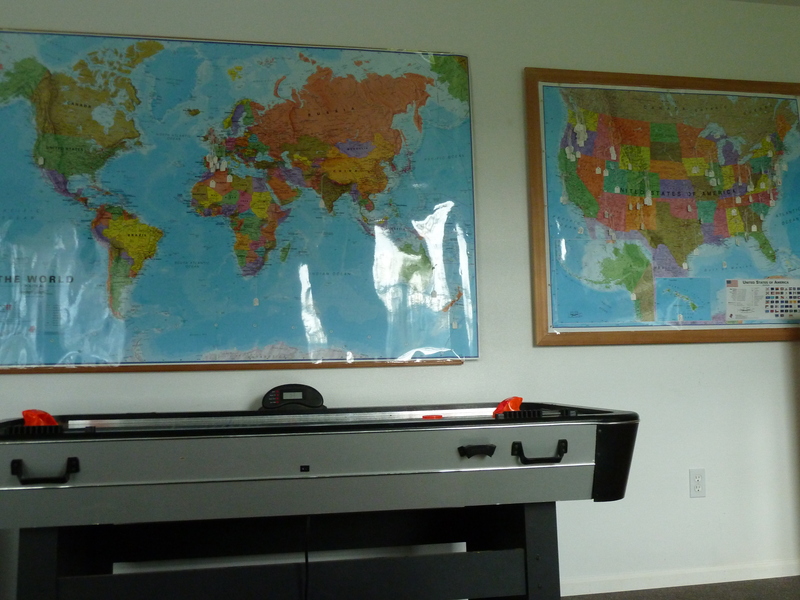 The couple that runs the hostel only asks that you sign the guest book, put a pin on the map to show where you’re from, and clean up after yourself. We were the first cyclists of the year to stay there and had the place to ourselves. We showered, played an intense game of air hockey, ate a good dinner, and slept well. Reading the guest book was fascinating. There were people on short two or three week tours, many cyclists going cross-country, and a few “Forest Gumpers”–people that have been travelling for years on bike, either back and forth across the country or around the world. One man that signed the guest book last year started his bike tour in 1997 and is still going. He wrote that he likes “the peace and quiet of the open road.” It’s unclear where he put his pin on the map. 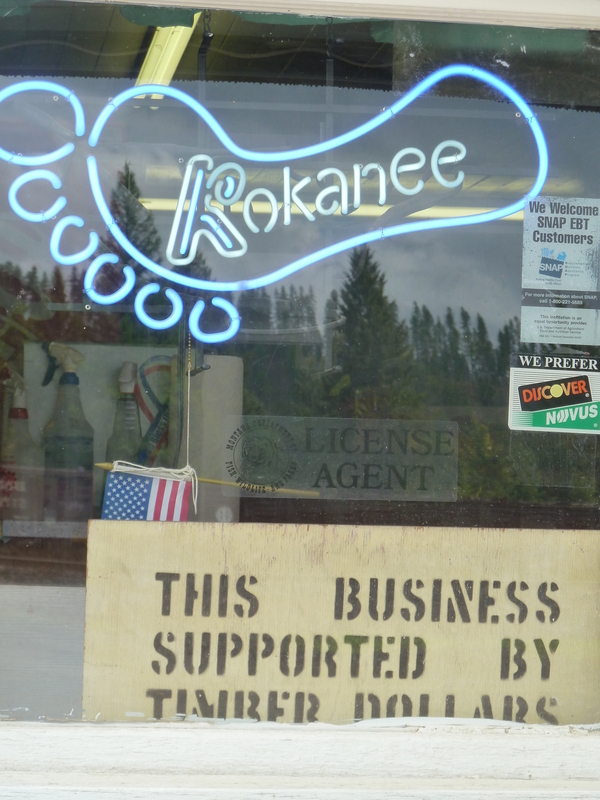 The next day, we pushed on through our last Washington State county: Pend Oreille. We went through towns named Tiger, Ione, and Usk. 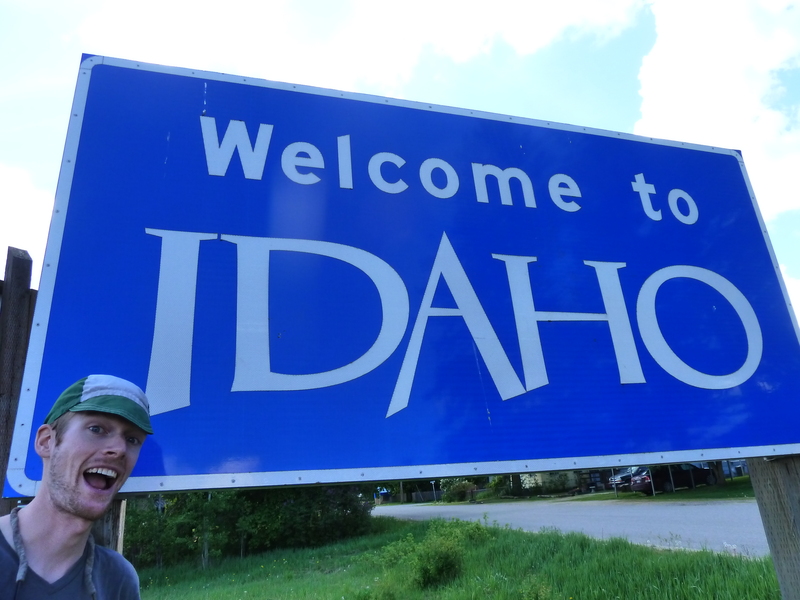 We passed through the Kalispel Indian Reservation and finally across the border to Idaho. 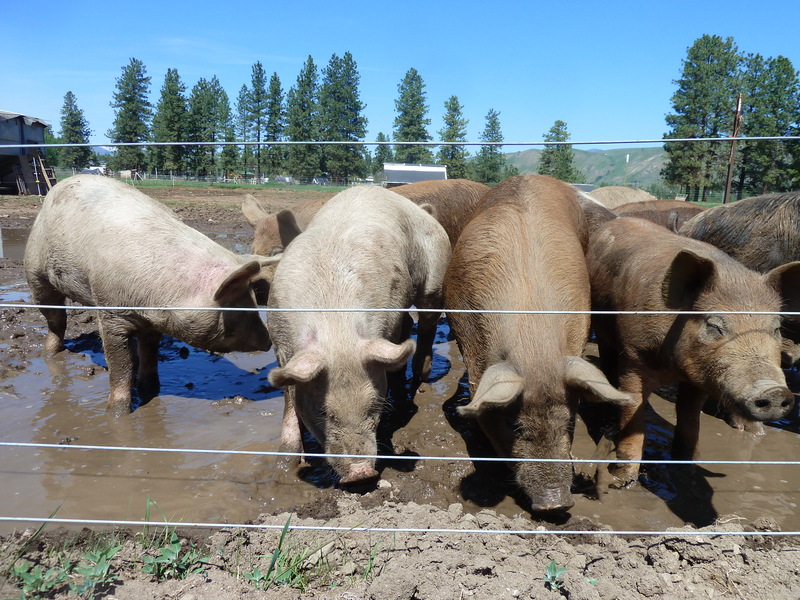 We spent a few days in the Methow Valley and I was lucky enough to do a farm tour at Crown S Ranch in Twisp, WA as part of a blogging project I’m doing for the American Farmland Trust. I don’t want to give the whole story away, but Crown S is run by two engineers–Jennifer and Louis–who decided to give up their engineering consulting practice several years ago to start a sustainable ranch. They are inspiring, incredibly hard-working people that almost can’t seem to help but apply the scientific method to farming. They ask WHY a lot and constantly learn and improve their ranching practices as a result. I really liked their pigs. And the bacon I bought. 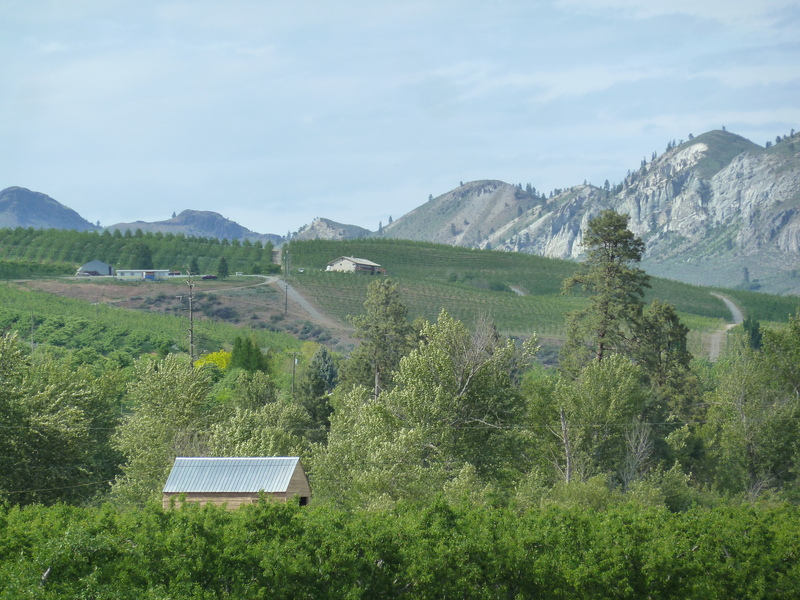 We did a 70 mile ride yesterday from the Methow Valley through Okanogan, Omak, acres of apple orchards and finally stopped in Tonasket. 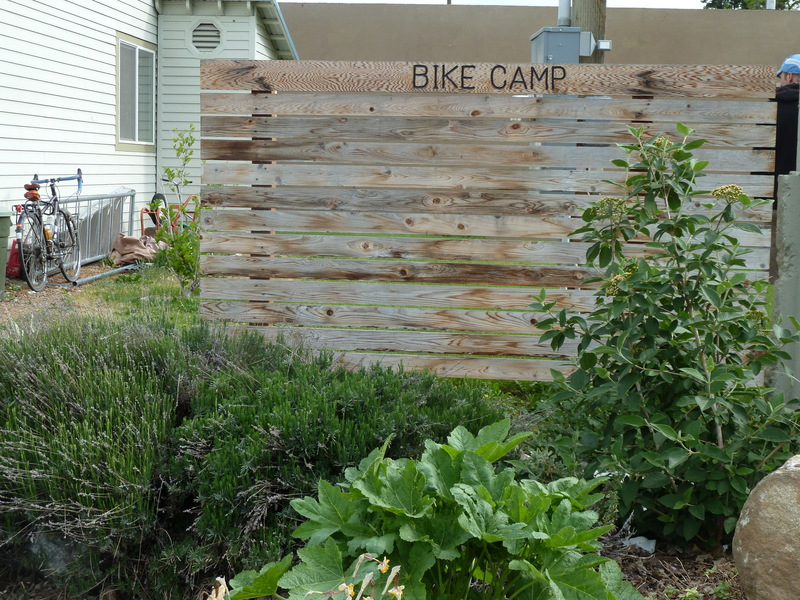 We have a bicycle campground in the backyard of our building, with a 24 hour open restroom. We are in the process of installing a solar shower. We are located on Highway 97, which is a popular bike route, and are only 21 miles from the Canadian border (British Columbia). We love having visitors, and are also close to restaurants and grocery stores. 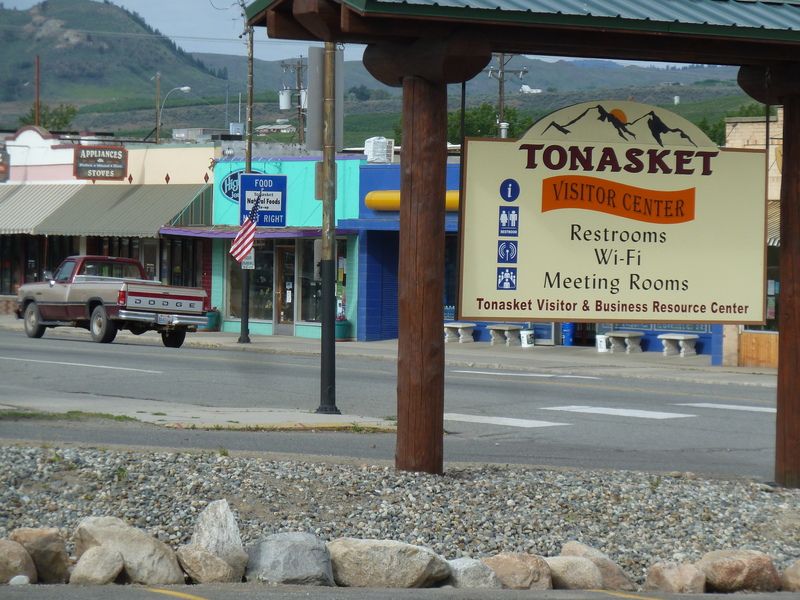 Tonasket is at the intersection of Highway 97 and Highway 20. An employee at the Business Resource Center said they host a lot of bikers in the “Bike Camp” in the summer. It’s a smart business development move for a small town like Tonasket to welcome hungry cyclists. Sean and I walked over to the Natural Food Co-op and dropped a chuck of change on local produce, cheese, cookies, and other tasty treats. On to the Aeneas Valley to check out were my parents were “back-to-the-landers” in the 1970s. King County: I’m off on another long distance bike tour. This time, across the United States and with a companion. Sean, my fiancé. The tour officially started last Friday on a brilliantly sunny day in Wallingford, one of Seattle’s many charming urban villages. We spent the prior afternoon clearing the last of our things out of our apartment and made final decisions about the items we were willing to pedal over mountains passes and across endless, windy stretches of road. All seemed to be going well with our packing until I discovered the condiments. There were so many. We had two fish sauces, two sticky bottles of Trader Joe’s Soyaki Teriyaki Sauce, jams, horseradish, several kinds of mustard, and innumerable bottles of hot sauce. Condiments are a sign of stability; they accumulate when you stay in one place. I had mostly been positive and calm during the preceding days of packing, moving, wrapping work projects up, and goodbyes, but the condiments seemed to paralyze me. The sleepless nights spent thinking about packing details and last minute to-dos caught up with me as I stared blankly into the fridge and started to cry. Fortunately, crying quickly turned to laughter thanks to the arrival of our good friend Mary who came to help with the final move-out push. “Just give us the condiments and we’ll decide which ones to keep,” she assured me as we threw the last few bottles into a cardboard box. Mary and Mike have way too many hot sauces now, but condiments do not travel well. My bike felt obese when I first got on it the next morning. We biked past my favorite, overpriced coffee shop under the Aurora Bridge, past the marina that was my second home the summer of ‘10, and over the sparkling Ship Canal on the Fremont Bridge where Seattle’s first bike counter displayed a 4 digit number. The weather was perfect. Why did it have to be so damn beautiful the day we left? I felt like Seattle had put on her lipstick and most flattering outfit in one final attempt to show me that I was making the wrong decision to leave. But, it was too late. The condiments were gone. The boxes stored. Waiting for the ferry, I looked at all the buildings. I spent thousands of hours in the office building on 1st and Spring–some hours stressful, some exhilarating, and many just ordinary. In other buildings, I remember tense meetings, giving presentations, speaking up, and quietly taking notes. I remember sitting in lobbies of other buildings silently rehearsing answers to possible interview questions when I was job-searching after college. There was my dad’s building. When I was a kid my mom and I would drive in the blue station wagon to 4th and Madison and pick him up when he missed the last bus. I loved the time alone in the car with my mom listening to Oldies together. 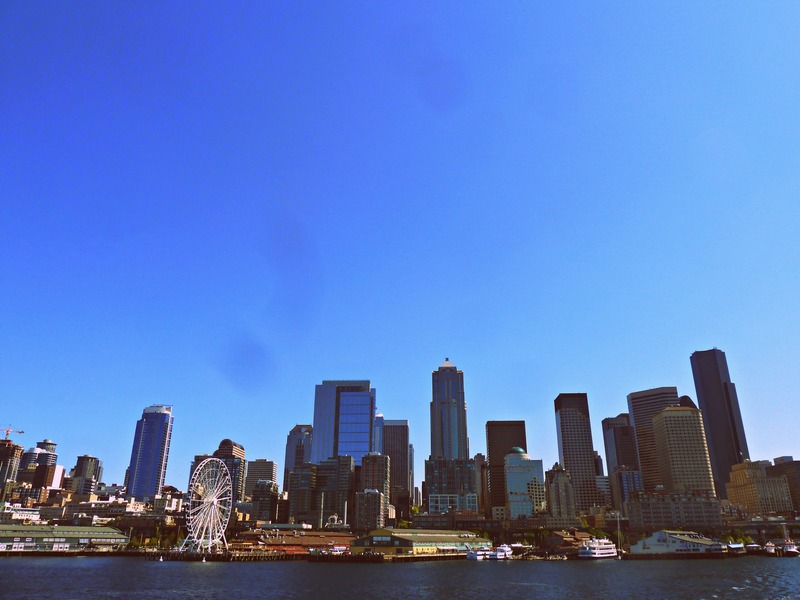 The ferry arrives, we ride on, and the Seattle skyline gets smaller and smaller. Kitsap County: After a short ferry ride and just 20 minutes of biking the city already feels far away. We turn up the road to Aaron and Dana’s farm and I see Dana weeding a row of spring greens. She is wearing overalls and a big farmer hat. She looks beautiful, strong, and healthy. Her freckles are already out in full force and it is just May. We hug and she tells me she is pregnant. I tell her congratulations and she tells me she feels like throwing up all the time. She tells me about how it feels to have morning sickness. Sean nods politely and I think about when I told Dana what “having a period” meant almost two decades ago when we were tomboys playing in the woods together. We keep the visit short, but I close my eyes tight when I hug her goodbye. Jefferson County: Crossing the Hood Canal Bridge isn’t as scary as I expect. In fact, it isn’t scary at all. Relief. We decide to camp at Oak Bay State Park. The campsite is on an isthmus and there are men in rubber boots digging for clams on the beach, but no other campers. I didn’t even know this place existed, but I really like it. 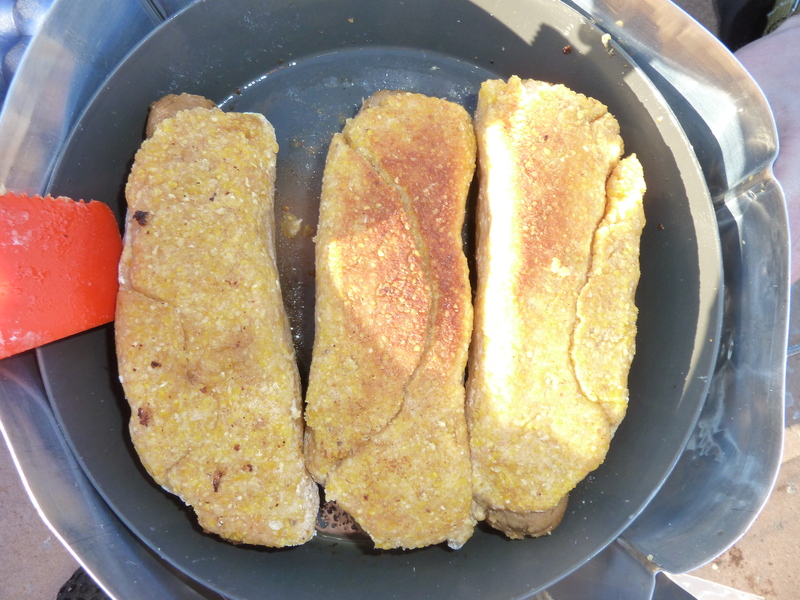 I make vegetarian corn dogs for dinner with the cornmeal, flour, and Field Roasts we brought. Sean is in awe, but we both agree that a condiment would be nice. We go to Port Townsend the next morning. The bike path into town is separated from the road and in the shade. Perfect. The town seems to be celebrating the weekend sun. We go to the Farmer’s Market, sit at a picnic table where a corgi is leashed, and eat an entire round of Mt. Townsend Creamery cheese with rolls. We don’t talk. We just look at the scene: street musicians, kids chasing each other, busy cooks at food carts, friends laying on the grass talking. Island County: After we get enough of the Farmer’s Market, we take another ferry to Whidbey Island and the views are stunning. There are farms on rolling hills with the Olympic Mountains in the background. Part of the ride is on the Kettle Trails, another separated bike path–but then we approach Oak Harbor and not only does the path disappear, so does the shoulder. We eventually realize that we should have turned a few miles back to stay on the suggested bike route, but we don’t really have the energy to bike back up the steep hill into town, so we push forward on the busy road. Fortunately, the shoulder reappears a few miles out of town–but the last 19 miles of our ride is loud and somewhat stressful with a steady stream of cars and trucks passing us. When we arrive at Deception Pass State Park, there is a long line of cars waiting to get into the park. Everyone is trying to enjoy the first sunny Saturday of the season. The overwhelmed park ranger informs that car ahead of us that all the campsites are full, but we stay in line to inquire about the hiker/biker campsites. Most Washington State Parks reserve campsites for campers arriving via human power–and we are in luck. There are open campsites for bikers. The park is teeming with people, but it is a beautiful night and after dinner we sit on the beach in the evening sun for almost an hour. When we get back to our tent, a friendly trio of British grad students bike touring from Vancouver to Mexico is at the campsite next to us. Skagit County: After crossing the Deception Pass Bridge the next morning, and rallying to celebrate a Northwest version of Cinco de Mayo, we buy guacamole ingredients at a roadside fruit and vegetable stand. I make a delicious guacamole at Bay State Park on Padilla Bay while Sean unsuccessfully retraced several miles of our ride looking for his Crocs. I perk up after drinking some water and eating peanut butter M&Ms. We bike 15 more miles to Newhalem where we camp along the Skagit River for the night. Whatcom County: The next morning we prepare to climb three mountain passes in order to get over the Cascades to the Methow Valley. It’s a Tuesday and the traffic on Highway 20 is very light. We go for 10 to 15 minutes at a time without any traffic passing. The day heats up quickly, but the mountain snow is melting quickly at this time of year and there are alpine streams at regular intervals providing shots of cool air, mist, and water. We pedal, drink water, stop occasionally for snacks and sunscreen–and pedal more. We get into a rhythm and eventually we gain enough elevation that there is snow on the sides of the road. As my head starts to get fuzzy from the heat, exertion, and repetition a car drives by and gives us a thumbs up and fist pumps out the sunroof. This small gesture seems to give me a boost. Wow. We’ve been enjoying WA State at it’s very best. The views of Mt Rainier, the Olympics, Baker, and the N Cascades are unreal. We’re currently in Burlington after spending the weekend enjoying the coast: Deception Pass, Port Townsend, and Padilla Bay. All is well…except Sean “Croc Rocket” Lee-Siebels lost his Crocs yesterday. He was really upset. Posting from Big 5 where replacements have just been purchased. Headed for the mountains. Longer update from Twisp, WA.